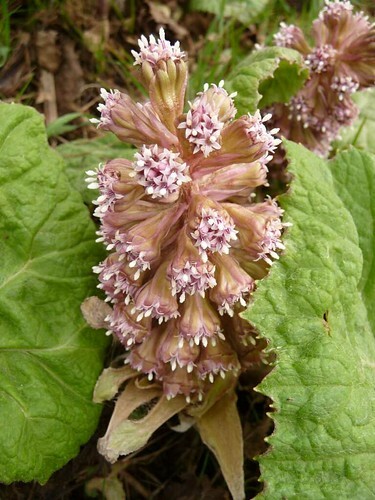 Butterbur grows in the damp places, beside rivers, wetlands and ditches. 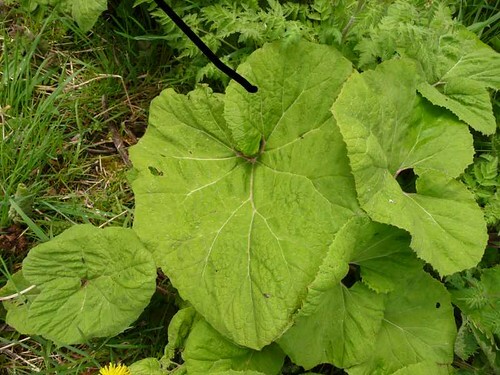 It is a relation of Coltsfoot. 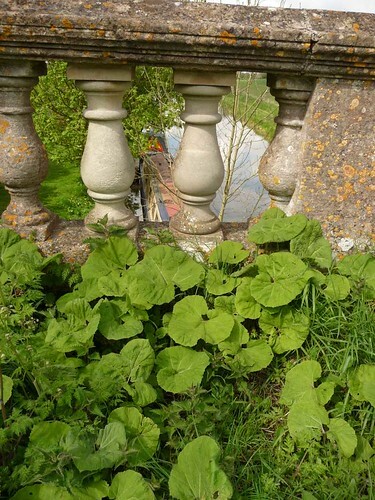 The flowers appear in the early spring, and like Coltsfoot, the leaves appear afterwards. In Sweden the plant is grown near to bee hives so that the bees can drink a good supply of early nectar. In the middle ages it was used to treat plague and fevers, and in the 17th Century it was a noted treatment for coughs and asthma. Being related to Coltsfoot, this makes complete sense. To treat these ailments one would harvest the leaves in early summer and the root in late summer, dry and store them for the winter months. A decoction of the root would be made to treat asthma and other bronchi-related ailments. 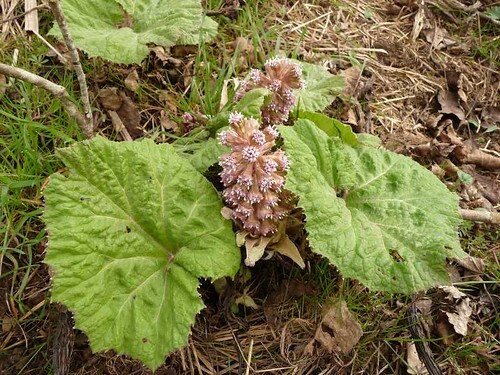 The problem with using Butterbur for internal medicine is that modern chemical analysis has shown that it contains some potentially harmful alkaloids. This opens up for us a debate which is ongoing between the pharmaceutical scientists and the traditional herbalists. Is a plant that contains small amounts of toxin actually bad for the system as a whole? Well, apple pips and apricot kernals contain cyanide, in very small amounts of course. It has been shown that eating your apple pips, as well as certain other foods containing trace amounts of cyanide, releases nitrilosides and vitamin B17 into the system. For years this has been seen by many investigators as a chemical that prevents cancer. It is controversial on the biology scene as it is dealing with cyanide, and fruit. Read an interesting article HERE. So the intake of certain toxins may not be the great body poisoning it is seen by some to be. A few years ago there was a study on the toxicity of comfrey. Comfrey has been used in mecdicine since before before, and will continue to be so used. 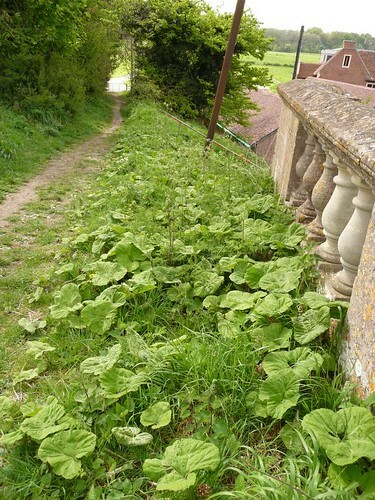 The study fed comfrey to rats for a short while with no adverse effects. Then it fed them the plant for a prolonged period and found that the rats began to develop liver tumours. The conclusion was that comfrey is dangerous. My conclusion is that you shouldn’t have a diet of only comfrey for a prolonged period. 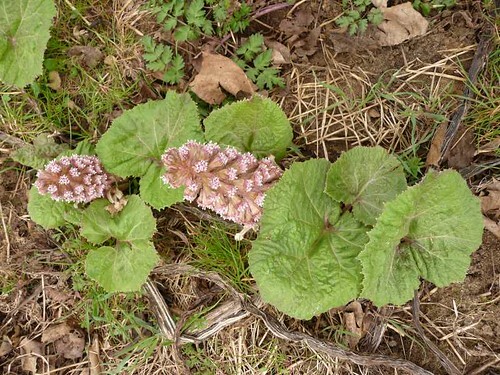 So back to butterbur. Should it be used as internal medicine? 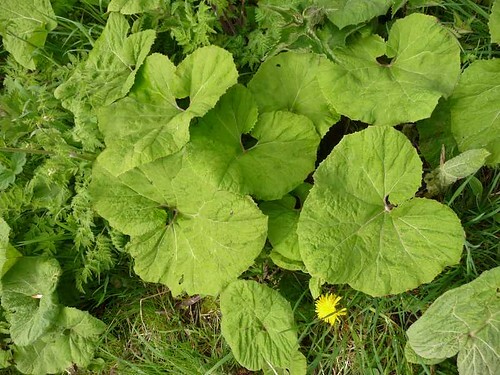 I would say that if you have a cough then Coltsfoot is the safer option. But if plague were to come along, i would consider this plant as internal medicine. 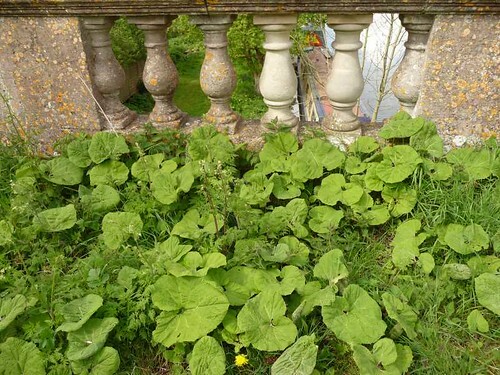 Juliette de Bairacli Levy, the famous herbalist who travelled with Gipsies and Bedouins throughout her life, learning their healing arts, advocates the use of Butterbur for the treatment of migraines. Juliette has just died at the age of 96. Thank you Juliette for your great works, you have inspired many to learn how to heal themselves and others from what is growing around them. The plant can certainly be used externally as a poultice for wounds and skin eruptions. Pulp it up a bit and apply it to the wounded area, and tie it on with a clean cotton cloth.